Second in a series on west side racetracks. In the Lake Merced parking lot at the south end of Sunset Boulevard is a statue of a man on a horse. The man represents Juan Bautista de Anza, the Spaniard who founded San Francisco in 1776. The horse is just a horse, of course, but the location of the horse's statue is historically significant for two reasons. On November 2, 1769, five years before Anza's colonists arrived in San Francisco, a small scouting party led by Sergeant Jose Ortega left the Portola expedition and traveled on the hard, wet sands of Ocean Beach, crossing into what would become San Francisco. This marked the arrival of the horse in San Francisco. One hundred years later, less than a furlong from today's statue of a horse and rider, the first of the west side's horse racing venues opened for business. This is the history of those race tracks. 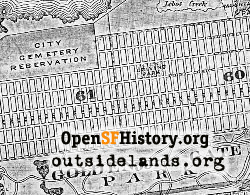 The next west side race track was a half mile oval adjacent to the Point Lobos Toll Road (today's Geary Boulevard). From the toll gate at Cemetery (Presidio) Avenue to the Cliff House four miles away, Point Lobos Road penetrated a virtually unpopulated landscape. When it was widened from 20 to 40 feet and regraded to make it level most of the distance, it was an open invitation to race. In response to this need for speed, an unnamed and long-forgotten visionary scraped out a primitive track on the north side of the road near today's 25th Avenue where informal and impromptu races between owners of teams could be held. In March 1868, James Eoff leased the land where the primitive track had been and laid out a half-mile track, along with substantial buildings, fences, and horse sheds. This track was located roughly between Clement and California Streets and 26th and 22nd Avenues. The purpose of what was at first called the Golden Gate Driving Park was to provide a type of racing that the other tracks didn't or couldn't offer: private racing, where gentleman could challenge each other to settle whose team was the better set of horseflesh. Rather than endangering the welfare of their horses and risking property damage from racing along the Point Lobos Road public thoroughfare, proud, competitive gentlemen, desiring to do their own racing, were invited to Eoff's facility. The track formally opened on October 10, 1868. The highlight of the day was the introduction of Norfolk, the star attraction and victor of the opening of the Ocean Course four years earlier. Eoff's Golden Gate Driving Park prospered because he knew what his patrons wanted and he obliged. By providing excitement and variety in his racing programs, Eoff kept a steady stream of competitors and spectators coming to his track. Week after week, month after month, James Eoff's facility was in operation while week after week and month after month the Ocean View and Bay View Course (another racing course located in the Bayview District) stood idle and silent. 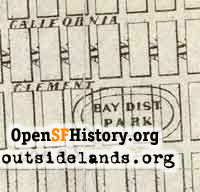 In April 1870, the Bay District Agricultural Association was formed and it leased the Golden Gate Driving Park for three years. A series of improvements were initiated. The track, which remained a half mile oval, was leveled and widened ten feet. The turns were banked, and the track was entirely enclosed with a fence. A roadway was built to the track's infield, allowing those who desired to sit in their carriages during to races to do so. Out buildings, including stables, were constructed and existing structures were vastly improved, including enlarging the grandstand for ladies. It was proclaimed the best half-mile track in the world. Agricultural Park was inaugurated on July 23, 1870 with an exhibition of stock and five trotting races. Three thousand people attended this event. The most notable difference between the Golden Gate Driving Park and Agricultural Park was the size of the purses, which, naturally, attracted higher quality racers, which in turn attracted a higher quality clientele, particularly ladies. Over the next three years everything seemed to fall into place for the little track by the side of the road and its owner, James Eoff. However, when the three-year lease expired in April 1873, the directors of the Bay District Association declined to renew it. At the same time there were rumors of a new mile race track to be built by the Association a short distance from Eoff's facility. By August 1873, the rumors were confirmed. In response to this setback, Eoff announced on August 2, 1873, that he intended to enlarge his half-mile track to a mile. He had purchased enough land at either end of his facility to extend the straight-aways, while keeping the turns the same distance. He expected that work on the track would commence immediately. 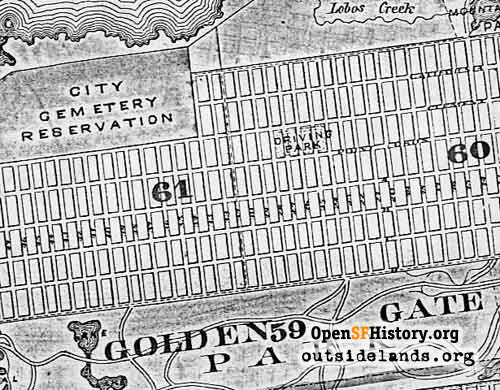 But his plans for a mile track never came to fruition and by August 8, 1873, the track was once again the Golden Gate Driving Park. The halcyon days of the little half mile track were clearly over. Not only could it not compete with the well-capitalized and opulent Bay District track, two miles closer to the city, but traffic on the Point Lobos Toll Road was slashed when a toll-free road to the ocean and Cliff House opened in Golden Gate Park in July 1874. The final race announcement at the half-mile track was on Sunday, March 29, 1885. After almost two decades of service, the venerable old track just ceased to be. There were no news announcements, no grand finale, no subdivision notices. It just simply ceased to be mentioned in any context. 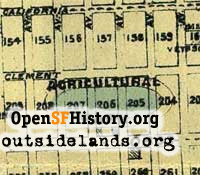 The city directory continued to list the track as Agricultural Park, located "on the north side of Point Lobos Avenue between 23rd and 27th Avenues," through the 1891 edition. Page launched 29 February 2008.